Seemingly, sports is going through some are tough times for the more conscientious among athletes and fans alike. Recently, too many incidents have been detracting from the sporting side of it, and have tainted the name of football with all the wrong connotations and cast an ominous shadow upon many other sports as well. Needless to say, similar occurrences are absolutely nothing new to sports, but lately it seems to have really kicked up a gear. 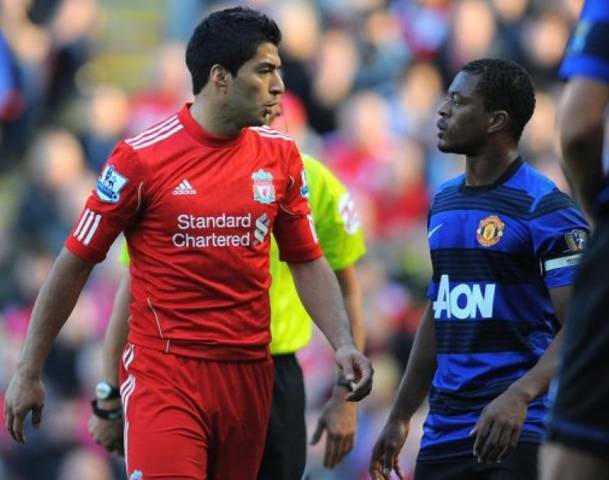 Among the more recent shenanigans is perhaps the most widely publicised spat between Luis Suárez and Patrice Evra (see photo above). It all started with allegations of Suárez racially abusing Evra, continued with rather immature reactions from both players, and has lately been overblown by the media to almost absurd proportions. Somewhat less in the limelight but no less controversial, and with even more far-reaching consequences is the instance of former England captain John Terry allegedly racially abusing the younger of two brothers Anton Ferdinand (see photo below). The incident led so far as to indirectly provoke a resignation of England manager Fabio Capello and saw the majority of English fans turn against Terry, as they feel that the national captaincy is something sacred and often even more important to the supporters than in the dressing room. The case will even see its epilogue in the court of justice, and Terry might not lose only his captain’s armband because of it, but his international career altoghether. So as we see, just a few indecent remarks, uttered in the heat of the moment, can quickly start an avalanche. Granted, verbal provocations among players on the pitch are probably quite common, but especially in cases of racial issues, it is rightfully treated with zero tolerance particularly by the British, but also many other media. Both of these cases attracted so much unwanted attention that eventually, even the British prime minister David Cameron decided to get involved. So later this month he is to hold a summit on racism in football, with participation of the currently involved players as well as senior figures from the Football Association and the Premier League. So quite a rigorous attempt to ensure that the sport is not dragged back to the “bad old days”, which are not too fondly remembered by the majority of British public, with the possible exception of ex-members of the notorious firms (video). Things are even worse in the Latin-speaking part of Europe, which remains one of the last bastions of racism in European football and where monkey chants or tossed bananas are not at all uncommon. This was perfectly demonstrated just yesterday, when Manchester City players Yaya Touré and Mario Balotelli both reported racist abuse and monkey noises directed at them by the home support in the Europa league match against Porto. And in Spain, we have witnessed another interesting development in the last two years, namely the cynical aggression and shameful gamesmanship (video) among team-mates from the selección. 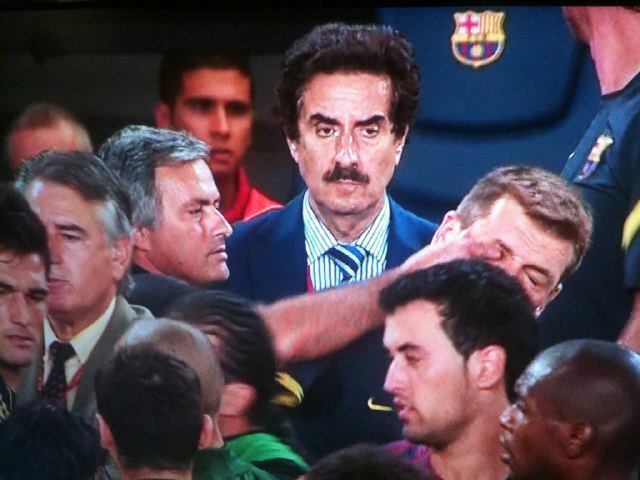 It is sad to see the antics and ugly rows between good friends from Barcelona and Real Madrid squads, kicking and shoving each other due to some contrived animosity and artificial tension, and for that I lay the blame squarely at the feet of Jose Mourinho (above). The man is no doubt a great tactician and a brilliant motivator, but his moral values are sometimes highly questionable. For this born winner matters are certainly exacerbated by his string of bad results and feeling of impotence against Barcelona, but this is hardly a sufficient excuse. So I fear the damage he inflicts by his negative and scornful approach towards his rivals, officials and the spirit of the game itself is (too) high a price to pay for success. Unfortunately, it does not end there by a long way. Racism is perhaps the most discussed issue (video), however abuse is not limited only to the colour of the skin, but extends prominently to nationality as well (also see our blog Let’s kick racism out of sport … forever!). One of the more recent examples was this Saturday’s handball game in the Challenge Cup, when several supporters of Slovene side Maribor Branik directed extremely tasteless chanting with downright disgraceful innuendo about Srebrenica genocide towards the away fans from Bosnia. Following an international uproar, especially in Bosnia, the Slovene authorities decided to press criminal charges of inciting intolerance and hate, so the offenders could face jail time of up to two years. Things went one step further during this year’s handball European championships in Serbia, with packs of Serbian nationalists brutally attacking Croatian vehicles with stones and even axes, and burning several down. 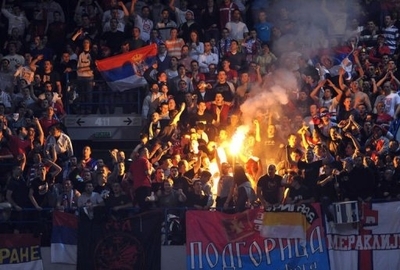 Similar stories have become common sight in ethnically divided Bosnia, and of course we are no strangers to scenes of brutal violence in practically any big derby in Serbian and Croatian sport. Of course, this region in particular is mired in controversy ever since the outbreak of the Balkan war almost 21 years ago, and remains so even after more than a decade of fragile peace, strewn with political volatility and nationalistic outbursts, but such brutal scenes always leave one appalled. However, such incidents are far from being isolated just to the Balkans. Practically not a week goes by that there are instances of such cretinous behaviour in some of the world’s more “vigorous” sporting environments, such as in Greece, Turkey, Russia or Poland, not to even mention some of the “Wild West” lower leagues in Latin America, Africa or South East Asia. And just as worrying is the fact that the hooliganism has started to spread from football to many of the less “incident-prone” sports. But all of the above pales into insignificance compared to the 1st of February and the bloody Wednesday, which we were “privileged” to witness courtesy of the Egyptians, who really took it to another level. 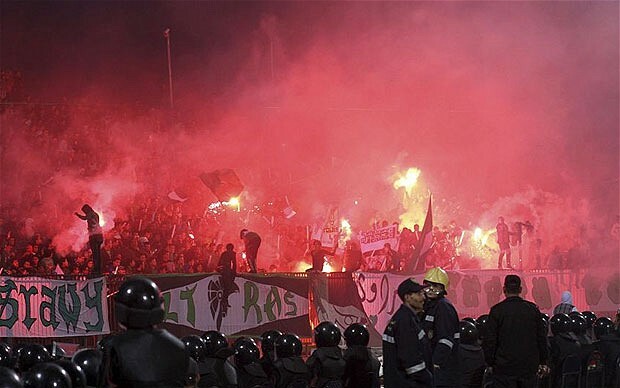 Almost 80 dead and several hundred injured was the “final score” of an Egyptian league match in coastal Port Said between the home side al-Masry and al-Ahly from Cairo. After 3:1 home win the celebrations turned into riots which quickly turned into slaughter. Visiting players and fans alike were beaten with sticks, bombarded with stones, bottles, torches and molotov cocktails, thrown from the highest tiers of the stadium and even literally hacked to pieces with knives and machettes. What began as an innocuous game of football quickly degenerated into one of the worst tragedies in sporting history. But what was even worse was the possibility that the massacre was politically motivated, and could have represented an orchestrated retaliation by the supporters of the deposed president Hosni Mubarak to the ultras of Al-Ahly, who along with arch-rivals Zamalek played prominent roles in the 18-day uprising that spelled the end of Mubarak’s rule. The fact that football was abused and exploited for political means, not to mention the scores of casualties this inflicted, is truly despicable and the sport had quite possibly reached a new low. To be continued… Get ready for Part 2. Coming next week. Guest author Jernej Ogrin is an avid football fan and likes the beautiful game to be played beautifully. On and off the pitch. He also loves the passion, the drama and the underdog story (apart from some of Europe’s biggest clubs), so he likes to bore anybody willing and unwilling to listen with his insight into the nuances of the game.